ONTARIO, Calif. /California Newswire/ — It will be a festive time Black Friday Weekend! While shoppers shop, those seeking eloquent items for that perfect Christmas party or shimmering adornment for that New Year's Eve 2016 special toast, will partake in the grand launch of Stephanie Wiltz Design & Decor Grand Showroom Launch. The excitement is in the air for this will be the first upscale (the go to) showroom for those with meticulous taste and refine ambiance lifestyles whom seek incomparable results for every occasion. The experience of the grand launch takes place in beautiful Ontario, Calif. located at 215 N. Laurel Ave. at 6 p.m. But who is the design decor planner orchestrating such lavish creations is no other than Mrs. Stephanie Wiltz Design & Decor Planner. 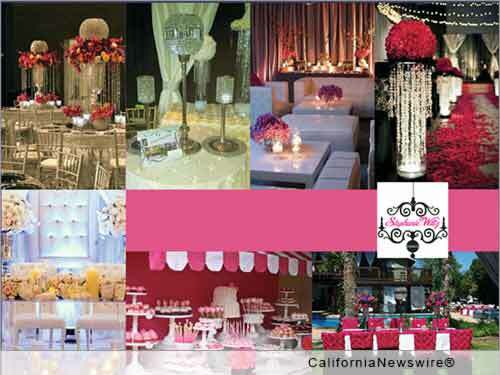 Stephanie Wiltz is an accomplished event designer who has built a name for herself and her company, "Stephanie Wiltz Design & Decor" in the Southern California Events Industry for over 15 years. Stephanie's professionalism, knowledge and talents have been recognized on many occasions wooing all that have experienced the creativity she brings. It was only time that she now displays her creative creations in this one of a kind showroom. Prior to devoting herself to her business full-time, Stephanie's passion for people led her to serve in the corporate Human Resources management field. Stephanie's gifts of organization, attention to detail, creative imagination, concept design and contagious enthusiasm, have earned her a reputation for unparalleled excellence as a successful event designer. Stephanie executes your concepts flawlessly while maintaining a pleasant and calm demeanor to ensure amazing experiences for you and your guests. Stephanie Wiltz Design & Decor Grand Showroom Launch is the perfect opportunity to not only see the showroom, but to purchase party favors. More than that, it's the perfect opportunity to meet the creator herself Stephanie Wiltz. The Grand Showroom Launch will display various created designs, showcase exquisite, hard to find linens from all over the world that can be rented as well as contemporary furnishings. This is a hosted cocktail party with hors d'oeuvres, music/DJ, and grand tours. Dress attire is cocktail dresses; suit and ties. Stephanie Wiltz is available for one-on-one consultations, to present creative designs for TV/news segments, as well as that perfect project in need of a unique creative designer. In addition, Stephanie Wiltz is available for interviews and writing creative idea columns. 6 – 8 p.m.: welcome, network, tours. 8:15 p.m.: special recognitions, address from Stephanie Wiltz Decor & Design Planner. 8:30 p.m. – close: network, tours. WHEN: Saturday, November 28, 2015 / 6 – 9 p.m. / hosted cocktail party, hors d'oeuvres, music/DJ, grand tours. WHERE: Stephanie Wiltz Design & Decor Showroom / 215 N. Laurel Ave., Ontario, CA. Or by phone For LA, Hollywood and BH – (323) 450-2249 IE – (909) 693-5292 Nationwide – (866) 678-3409.